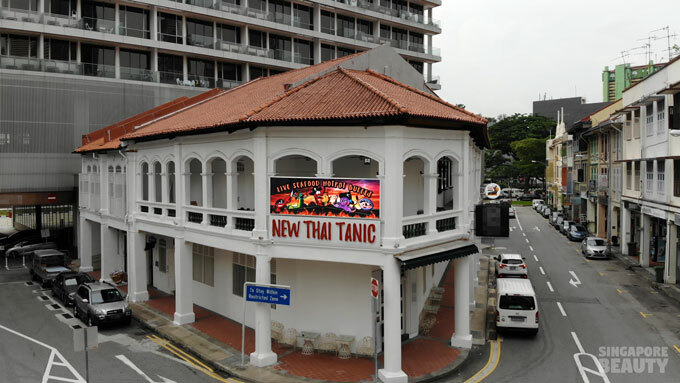 New Thai Tanic live seafood hotpot is located at the second storey of a heritage mansion at 44A Bukit Pasoh Road, next to Exit H of Outram MRT station. 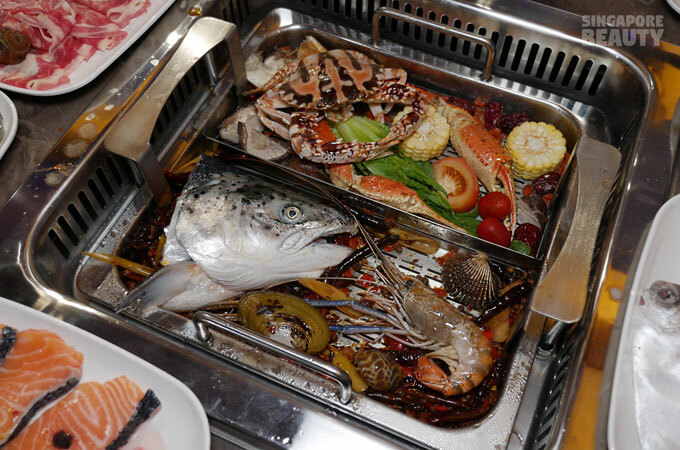 Officially welcoming their first guests on 26 May 2018, this is Singapore’s First catch your own live seafood automated hotpot buffet. At the reception area on ground level, help yourselves to free flow iced drinks and some refreshments while waiting. Do remember to get your queue number before settling down with some snacks. 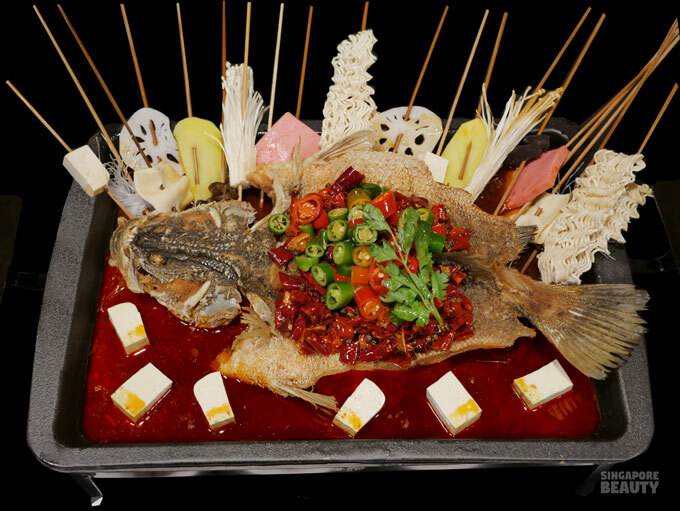 Avant-garde concept of hotpotting besides a personal reservoir of live seafood housed in chic ocean blue tanks. 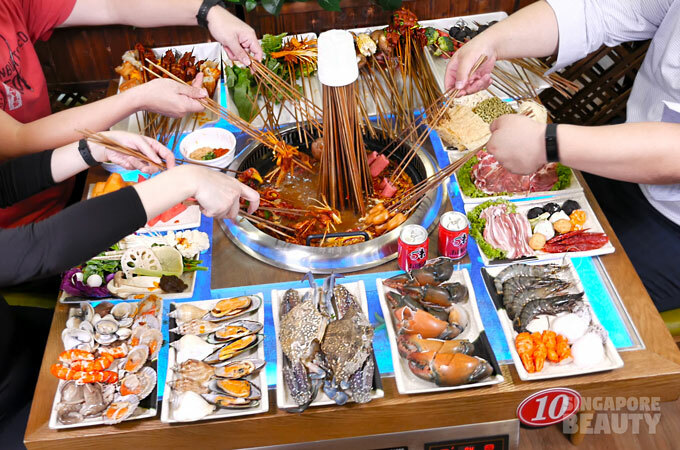 Catch live seafood, iced and cooked in hotpot style while seated at your table. 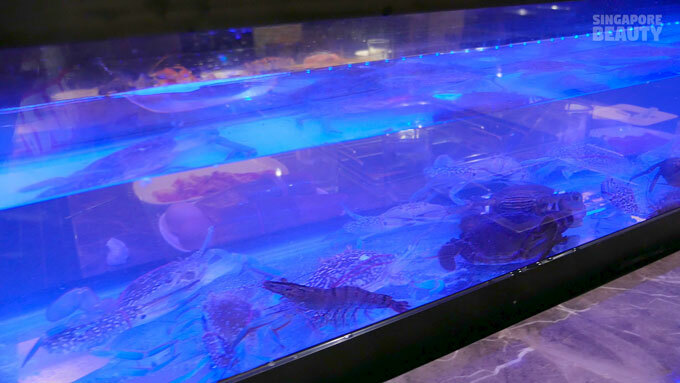 Live seafood such as tiger prawns, mud crabs, flower crabs and shell fish are found in the chic ocean blue tanks where you are encouraged to catch the live seafood with the tongs provided. 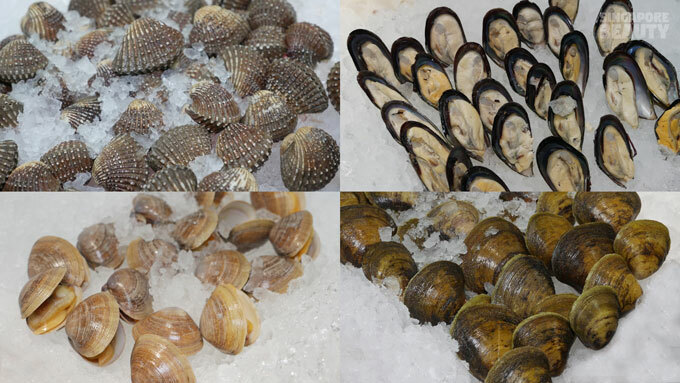 TheShip – More variety of seafood are available at the secondary deck of this New Thai Tanic “Ship”. 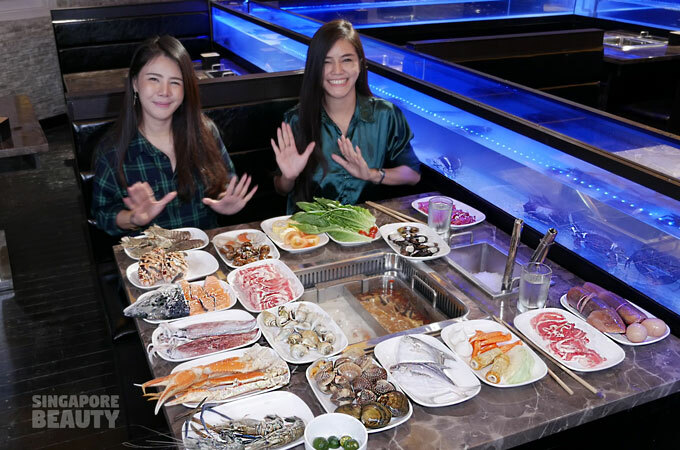 The signature New Thai Tanic Ship with seafood on ice. 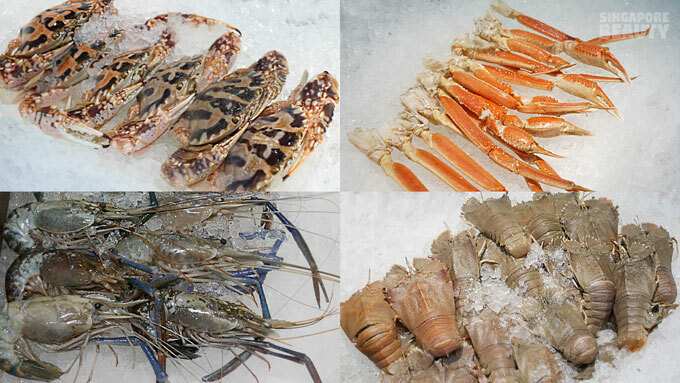 Over 25 types of seasonal seafood to choose from such as scallops, deshelled oysters, gong gong, whole pomfret, golden pomfret, seabass, snow crab legs, squid, mantis prawns, tiger prawn, crawfish, baby octopus, giant honey clams, salmon, Hotate (Japanese scallops),blue flower crabs, slipper lobster, river prawns, musk crab, sea conch, squid, bamboo clams, blood clams, la la, mock abalone and many more. 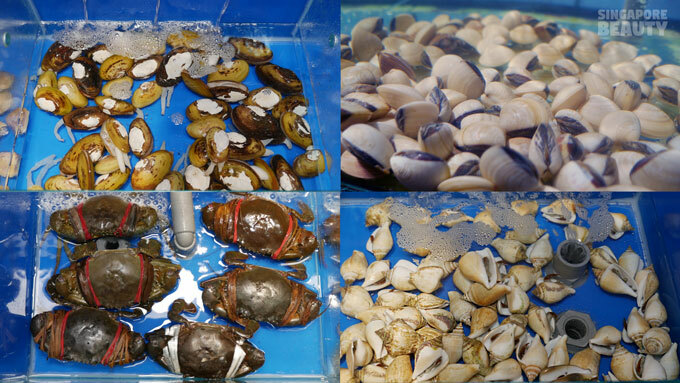 There are also seasonal specials like free flow seafood- lobsters, abalone or exotic shellfish. 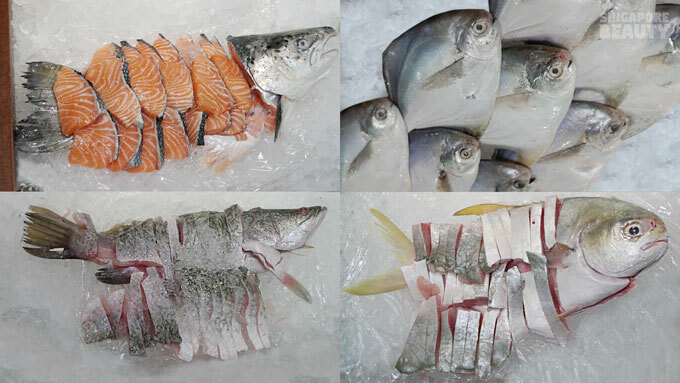 Live Seafood Tanks – Besides the iced seafood ship, there are 10 tanks of seasonal live seafood in the 2 tiered tank featuring Singapore’s favourite live ocean catch. 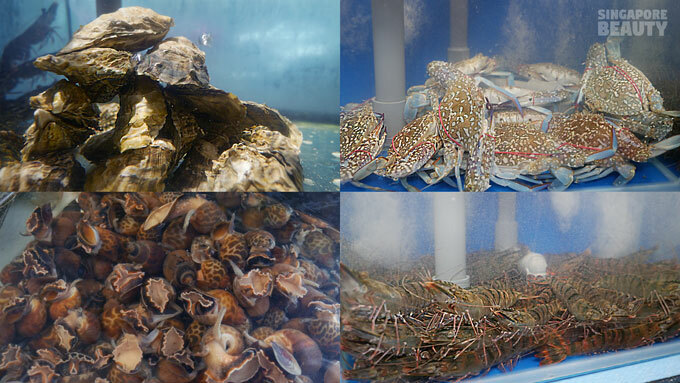 Housed in the fresh water tanks are live flower crab, mud crabs, tiger prawns, gong gong, mussels, clams and many more. 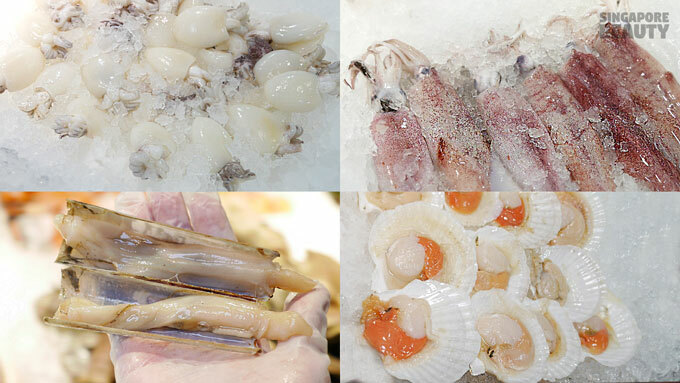 The live seafood are handpicked and delivered daily to the restaurant from their affiliated seafood nursery. 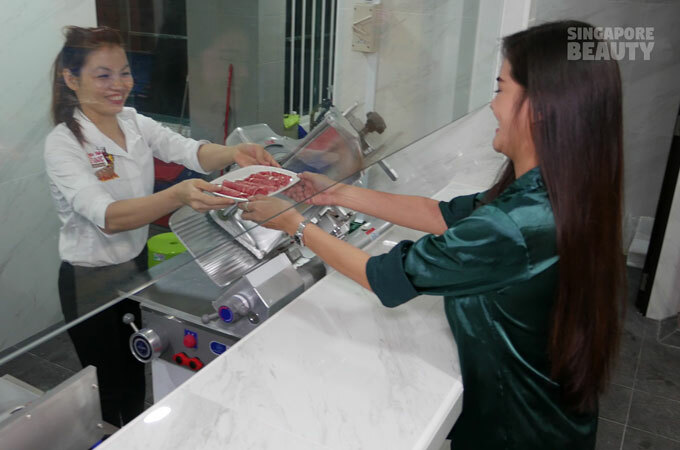 Live station – get your freshly sliced shabu shabu meat(lamb and beef) at the show kitchen. 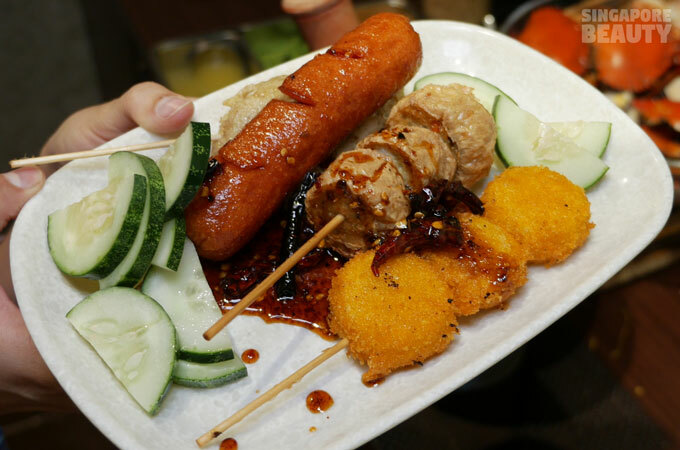 Fried-to-order finger food available are wings, fishcakes, sausages and many more. These are fried to golden perfection right before your eyes in their show kitchen. 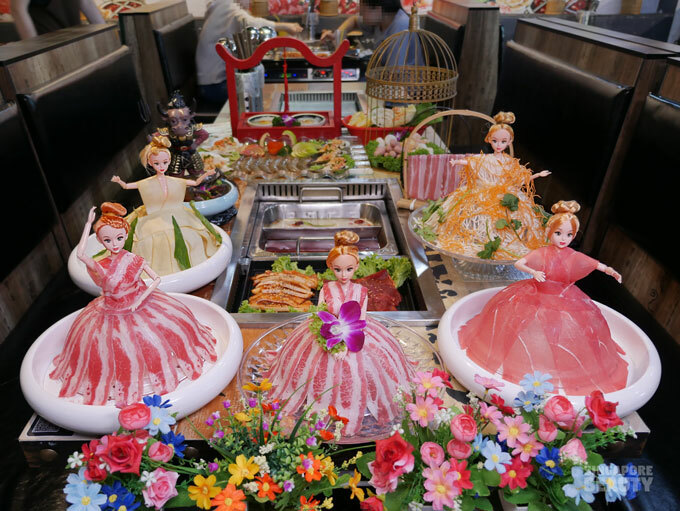 Included in buffet. 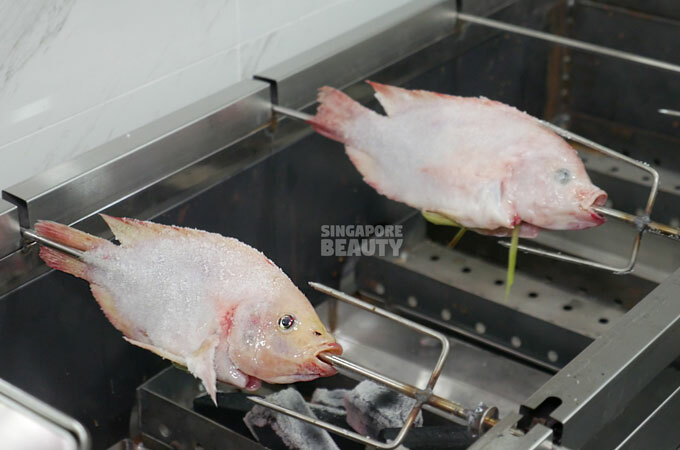 Order their grilled-to-order live fish in automated red hot charcoal pit. These are sea salt crusted grilled fish with lemongrass wraps (Pla Pao) served in bite size portion in shot glass. Included in Buffet. 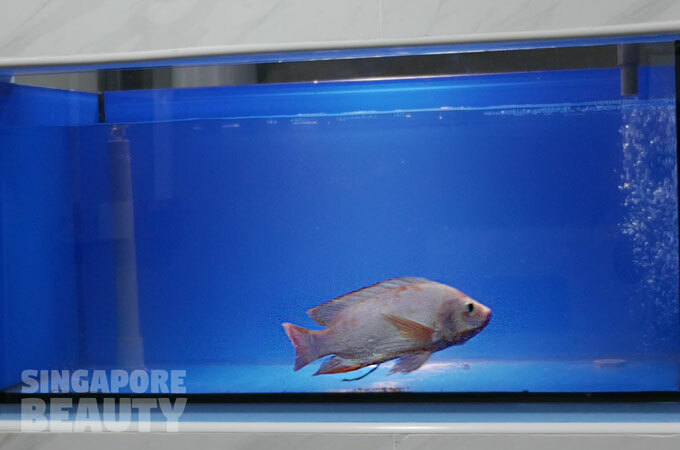 These live catch are kept in tanks so that every grilled fish is the freshest they can be. 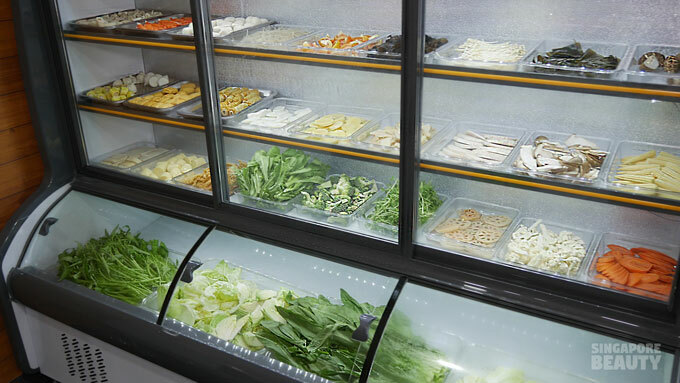 Greens & Surimi Station – Chilled greens cabin serve washed and ready to eat greens like lettuce, carrots and some other hotpots sides like cabbage, lotus roots, king mushrooms, fish roe balls, crispy bean curd skin and surimi. 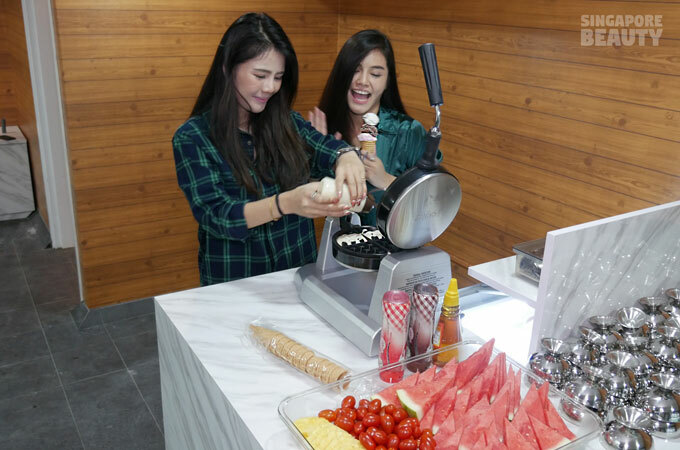 Ice-cream and Belgian waffle station – DIY your own freshly baked piping hot Belgian waffles with scoops of ice cold creamy delights from the ice cream station. Choose from six flavours of ice cream to choose from such as Thai milk tea, coconut cream, double chocolate, strawberry jam, sweet corn and lemon sherbet. Top your waffles off with a drizzle of chocolate, strawberry, honey, cut fruits or eat them in any way you fancy! 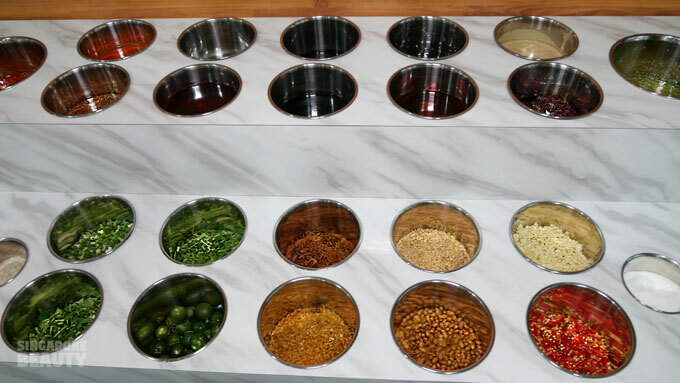 DIY sauce counter – DIY your own dipping sauce with over 28 types of condiments. There is a guide to assist you to D-I-Y 3 of their signature Thai chill dips. 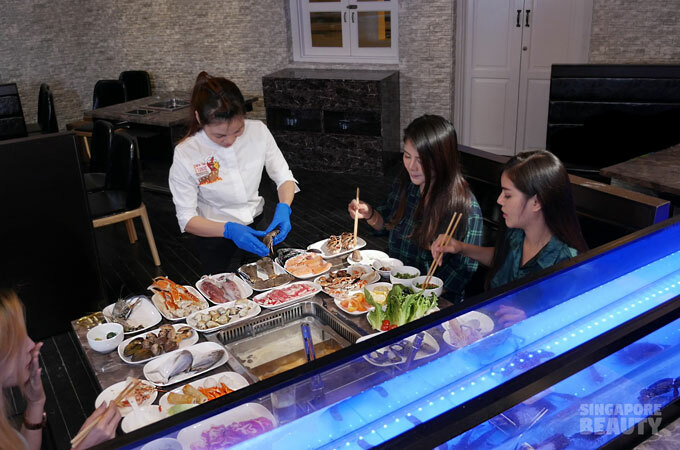 Deshelling Service – New Thai Tanic Live Seafood Hotpot also offers table to table dispatch service for crabs and deshelling service for slipper lobsters so that you can sit back to enjoy the hotpotting experience. 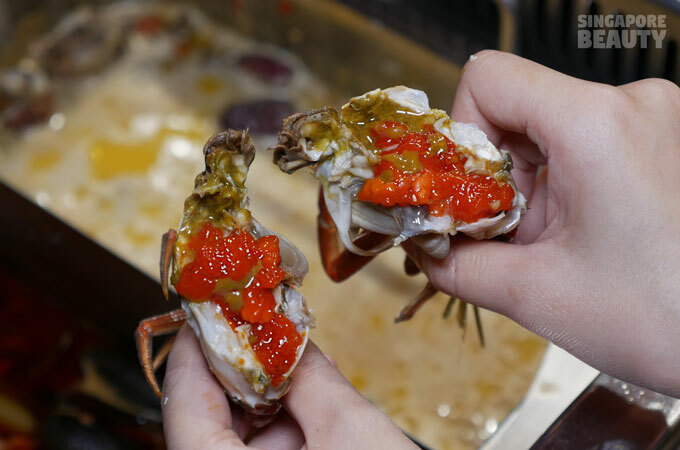 We are lucky to get some crabs with loads of crab roe. 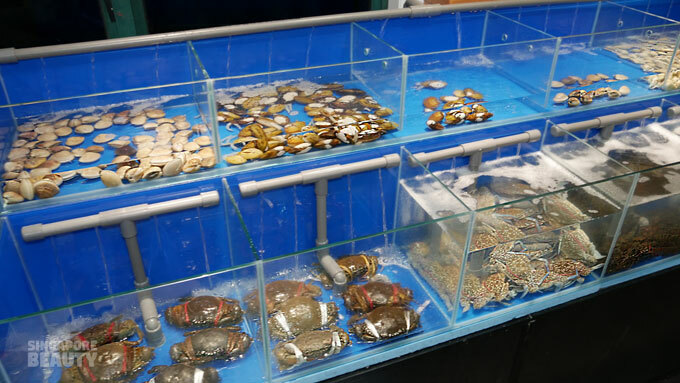 Great news for crab lovers! 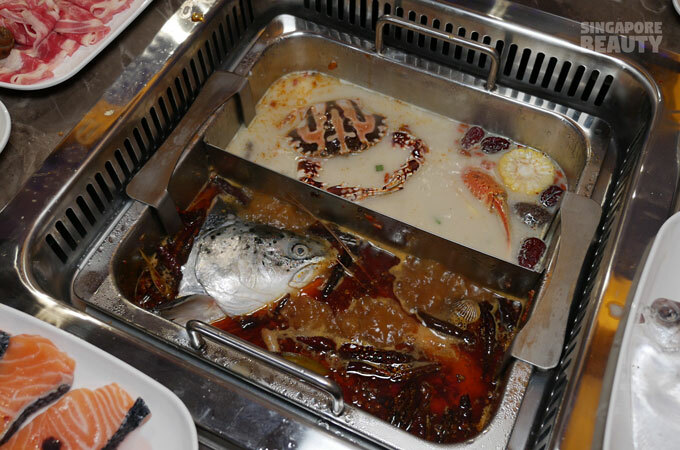 Add all your favourite seafood, meat and greens in the automated hotpot. 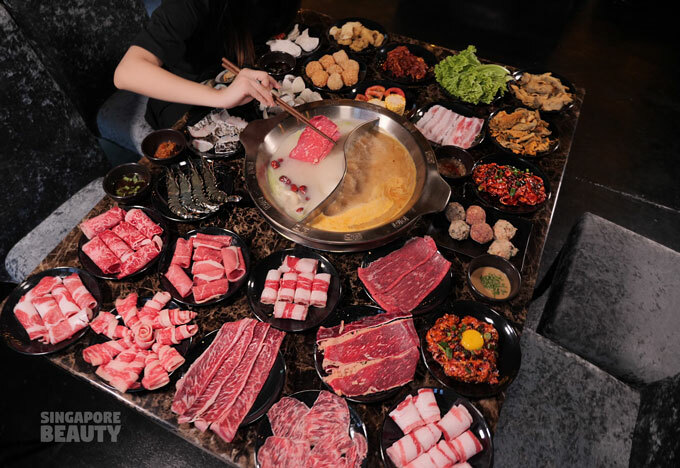 The automated hotpot comes with a tray that elevates all the food from the soup base in the hotpot once you are ready to eat them. 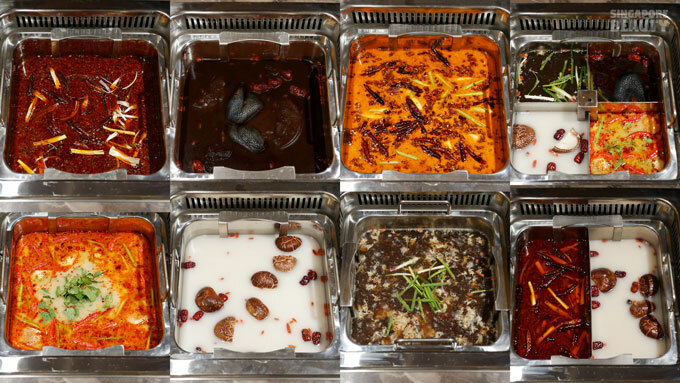 Choose from six soup bases – Signature Tom-Yum-Mala, Chef-recommended Tom Yum, Mala, Black Chicken Collagen soup, Shark Fin (mock) soup and abalone soup. 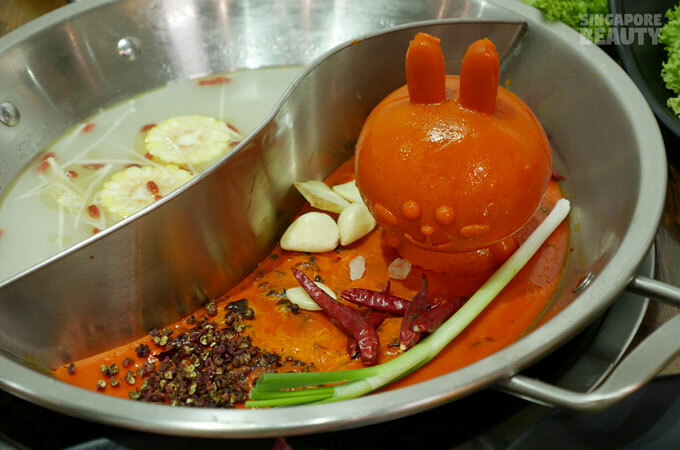 You may request for single soup base, add-on duo soup base (+$12) or up to 4 soup bases (+$18) for this hotpotting. 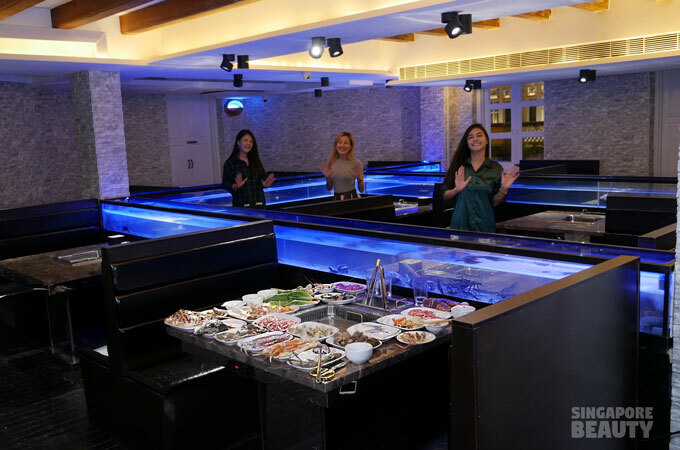 Featuring a casual yet classy interiors with cushioned high backed seating that can hold up to 100 pax, ample alfresco outdoor seating and a VIP room with amenities. 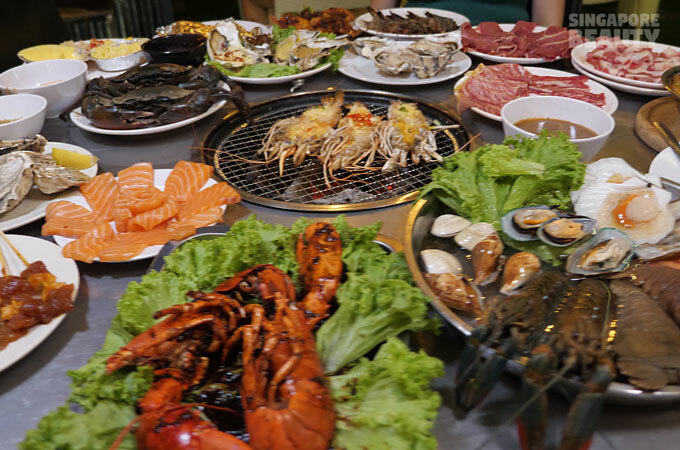 New Thai Tanic live seafood hotpot is a great venue for 4 pax above and events. 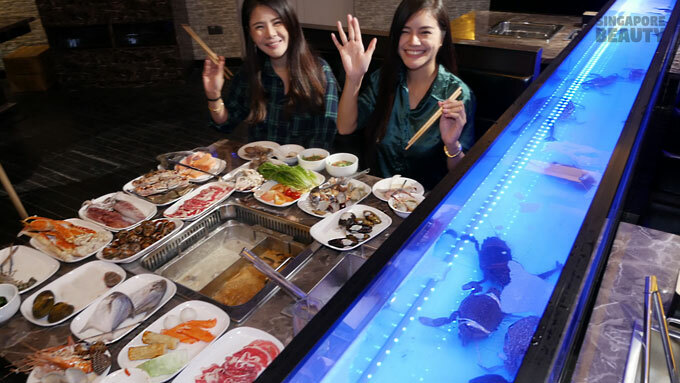 Head over to New Thai Tanic live seafood Hotpot today for that Singapore’s First catch your own live seafood automated hotpot buffet experience! Promo: 20 % off for adult diners for November and December. Recommended to walk-in. With SMS queue system.